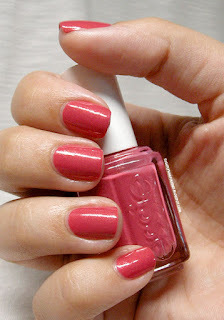 Essie- Your Hut or Mine is a dusty pink coral with beautiful shimmer. It was release last summer as part of the 2011 Fair Game Resort Collection. I like the color a lot more than I'd expected. 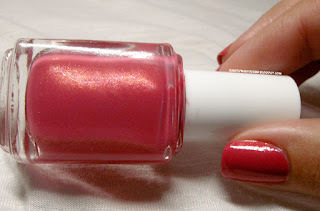 I got this polish in a lot from eBay in winter 2011 and it sat untouched in my polish rack for a long time. It looked muddy/murky to me and I was going through a huge pastel phase. So I just wasn't interested and couldn't be bothered. Some time later, I picked it up and decided to use it completely out of the blue. It wasn't until I saw it under light that I saw how beautiful it was. The shimmer made it so much brighter and alive. Another view of the shimmer. It's sort of hard to explain. It looks to me like a hint of pink and gold. But in some lights it looks more orange, in others the pink looks a little purple. It's really a beautiful mix and stunning in the sun. It's no where near as shimmery on the nail as it is in the bottle, sadly. But you still get a glimpse of it here or there, which is fantastic. I have 3 coats applied here. The consistency of this polish was a bit of a problem for me. I found it to be a little thick and hard to apply. I checked my other bottles (somehow I acquired 2 extra bottles) and they seem to be a little more on the runny side. 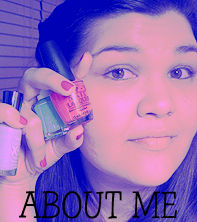 It may be hit or miss with this polish. It just depends. And take into account that it does thicken over time. Wear was okay. Nothing to really write home about. Minor tip wear on day 3, which is about the time I would have taken it off as I can't leave my nails one color for very long. But it's definitely not one I'd put on to leave on for a week. All in all, I think this is a great polish for the warmer months: Spring, Summer and into the Fall. 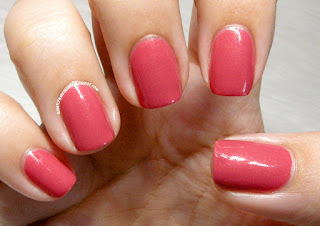 As long as there is sun out I'd wear this polish! Obviously, as I own 3 bottles of this shade, it's one of my favorites in my collection.